The kitchen is finally complete! The last two months have involved a lot of waiting on things to get in, but it is all done. With the countertops installed I was able to go ahead with a layout scheme. The tiles are glass, of different heights and widths, and on a floppy mesh. Figuring out where and how to cut to make it around the outlets was tough. Everything started and stopped at a metal quarter round boarder strip. After a few different tactics I figured out that measuring everything from the edges and countertop gave me the best results for cutting around outlets. 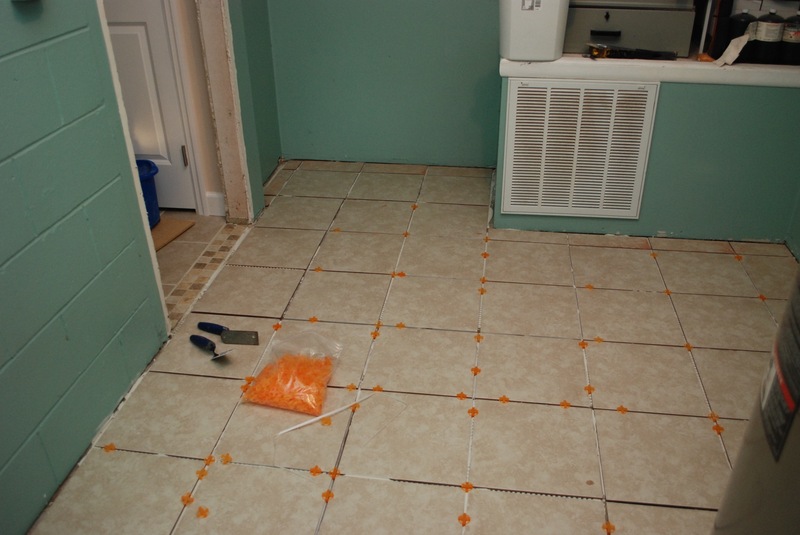 T he gaps between each tile varied between 1/8″ and 1/16″. It made any errors on my part easier to hide, but keeping everything looking right meant I needed a variety of shims. When installing the tile I did my best to keep the gaps clean, but sometimes the mortar squeezed through. It is tough to clean without disturbing the wet tile too much. Instead I waited till it was cured and used a custom little tool to scrape it out. It is a thin putty knife ground down to make a small hook/dovetail shape. I was able to get into the gaps and clean out any stray mortar that even the smallest grout saw couldn’t get to. With all the edges and gaps cleared out I could move on to grout. Backsplash grouting seems to be pretty similar to floor grouting. The grout is un-sanded on account of the narrow gaps, but otherwise you smear it on, let it sit for a bit, then wipe off. The high ratio of gaps to tiles means a lot ends up staying in place and getting wasted in the wiping. Hazing is really noticeable on the glass tiles, so they took a few dozen extra rounds of wiping, but you really knew when you got it all. After months of work and waiting, and more money than I care to admit it is really good to have a gorgeous working kitchen. Time for a kitchen warming party! After a lot of early salvos, the kitchen war has finally begun. First, let’s look in horror and disgust at the kitchen that was. Painted 1980s particle board cabinets with rotted bottoms, dark blue peeling paint, and no flooring. Not a pretty set of pictures. Don’t look too long, you will hurt your eyes. Granted the next set of images aren’t that much better. I happily smashed cut and dragged out all the old cabinets, and peeled the various paint layers off. At least it looks a lot brighter in there. Most of the kitchen stuff and appliances had to be spirited away to back rooms and the porch. What was left was the bare essentials. I call it Kitchen Base Camp Alpha. Next came the sanding of texture. When the house was built, some kind of roll on orange peel texture was used. In decades since installation it has turned to powder and sluffs off in chunks. Every square inch of wall had to be sanded back to the drywall. It was messy business. Next came patching of various issue areas, priming, more patching of missed issues, and then two rounds of the brilliant blue/green color that was in the living room. At this point I got a lot of plumbing and electrical fixtures changed, and even a bit of routing done to account for changes in cabinet location. With the walls complete I could scrape the floor of any glues or gunks and get to tiling. As usual odd walls and squareness issues confounded me, but I was able to stitch it together pretty well with the existing living room tile I did last Christmas break. I could now work on the small pantry without any fear of getting in the way of cabinet installation. It would give us a place to put back some of our boxed junk and help out in minor cooking adventures at Kitchen Base Camp. I went with adjustable wire shelves and wired an under-cabinet light in the top that goes on with the lights over the stove. Some basic molding happened on the inside, but most will wait till I can do everything after the cabinets are complete. Until the cabinets get installed we got to move a few essentials back into the new area. I call it Kitchen Base Camp Beta.